Hey there Peeps! Happy September first! You know what that means?? Right... 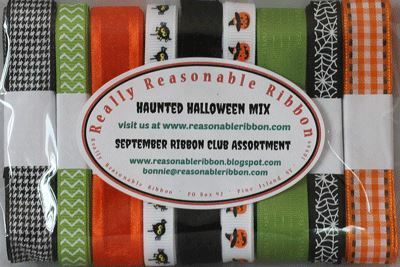 I get to share a fun project created with the new Ribbon Club Selection Haunted Halloween Mix. I don't even have to tell you how much I love this assortment of spooktacular trimmings!!!! This new Black and White Houndstooth has moved into my #1 favorite ribbon position. I'm using my Vintage Halloween Tags with Harlequin Background digital collage sheet as a focal image and layered lots of patterned papers from my holiday stash. I've got some fun punched flowers topped off with Cottage Roses and Open Roses from Wild Orchid Crafts. There's some additional vintagy images from my Vintage Halloween Creativity Kit. I've added a bit of Gladys Black Crocheted Lace to the roof of the little house and topped it off with some dimensional trims. This is a great Halloween project! Really putting that ribbon to good use.